Kieran Nolan (b.1976) is an artist-researcher, indie-game designer, and academic. He is a lecturer in Creative Media at at Dundalk Institute of Technology’s School of Informatics and Creative Arts, where he is also Co Director of DkIT’s Creative Arts Research Centre. Kieran is currently a PhD candidate in Digital Arts and Humanities with the Graphics Vision and Visualisation group at Trinity College, Dublin. His PhD research explores the aesthetic, material and connective properties of the arcade videogame interface through the lenses of game studies and media art. 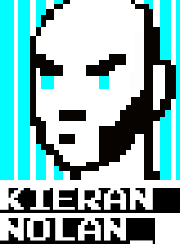 Kieran’s research work has been published at conferences and exhibitions worldwide, including Vector Game Art and New Media Festival (Toronto), The Science Gallery (Dublin), Leftfield Collection at Eurogamer Expo (London), Future and Reality of Gaming / F.R.O.G. (Vienna), International Symposium on Electronic Art / ISEA (Belfast, Hong Kong), ZIL Cultural Centre (Moscow), the A MAZE. International Independent Video Games Festival (Berlin), METEOR (Tokyo), MAKE (Cork), Transmediale (Berlin), Art.CHI (Seoul), Game On! El arte en juego (Buenos Aires), Out Of Index (Seoul), CHI Play (Amsterdam), CEEGS (Lublin, Trnava), Playing The Game (Milan), IEEE Games, Entertainment & Media (Galway), iHCI (Dundalk, Limerick), Replaying Japan (Nottingham), and DiGRA (Lunebürg, Dundee, Turin).